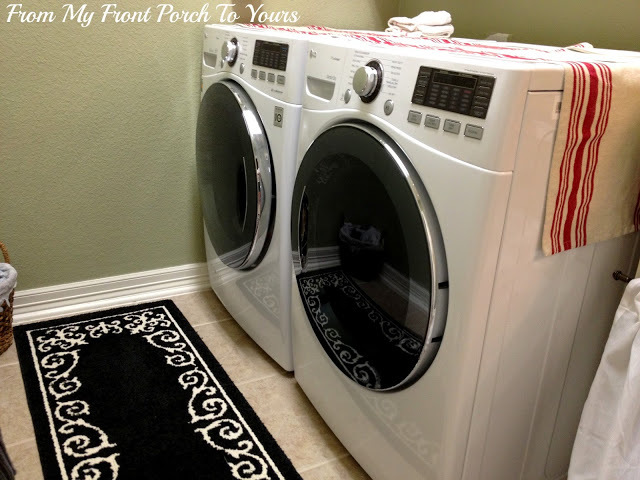 Now that it has been a week since the old new washer and dryer were picked up and the new new set delivered I thought that I would share my two cents. I was completely and totally against getting a front load washer & dryer set even though the sales person insisted they were the best. After reading so many negative reviews on them in general those were a no go so we brought home this beautiful LG HE Top Load Washer & Dryer set. I was in love and mesmerized as I previously shared. Approx 12 loads later that completely changed and we returned them within a weeks time. Major issues where that the clothes only half time moved around from top to bottom in the washer. You could not do small loads nor large loads. The loads had to be perfect. You also can not wash water resistant or water repellent items in the top load. That was not known till after it arrived and we opened the lid to see the sticker. How are you suppose to wash mattress pads? I could only imagine the nightmare if we had little ones who still wet the bed. The washer never stayed balance no matter how it was loaded. I constantly had to stand watch and fix it even after it attempted to fix itself by draining all the water out and refilling itself. Clothes came out terribly wrinkled even after adding liquid fabric softener. 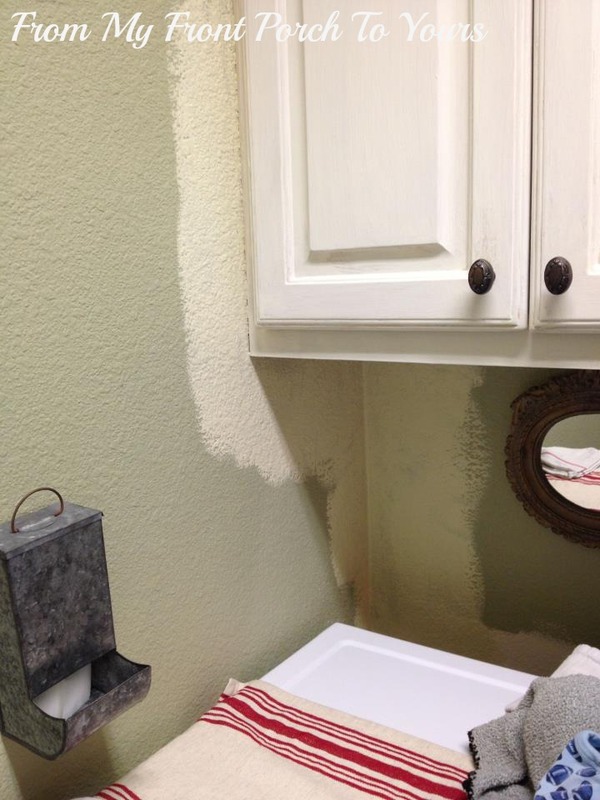 Water staid in the bleach dispenser and fabric softener dispenser. It was advised that you leave the lid open to prevent mold. That was a huge issue for me because I did not want to walk by and see the washing machine lid open all the time. Lord knows what would have happened if one of the cats decided to jump in there! :( It took an hour or more to wash and then an hour to dry. The steam function on the dryer did not work nor did the dryer actually dry all the clothes. They would come out with damp spots on them. Huge problem again for me. I like my clothes dry! The set also had a smell to them and not like a new car smell. Now don't get me wrong there were a few positives to this set. It would be unfair of me if I did not point those out. The set looks really pretty. Secondly this set was extremely quiet which we loved and well that is it on the positives. That left us with buying the LG HE front load washer and dryer set.This set right from the get go had three strikes against it. One they were front loads. Two they did not have control panels up top on the back so that left me with unpainted wall. Third the washer HAD to be on the left and not the right. The door is not interchangeable. My entire laundry life I have always done laundry from right to left. I am a major creature of habit. I figured what the heck though we could always return um. After they were installed not only was my laundry world turn around but they stuck out almost and inch and half further. I had a semi bought of claustrophobia. Still I pushed on. During the test run we noticed how terribly loud the washing machine was compared to the previous new set. Probably just as loud as our 8 yr old set. We thought that would go away after clothes were actually put in it but no. This washer is loud. I however decided that it was not an issue when I saw that it actually cleaned our clothes in 40 minutes or less instead of an hour or even an hour and 20 minutes like the top load. With the front load you can do ANY size load you want and if you need to add something after the fact all you have to do is hit pause and throw it in! Once the pause button is hit the door unlocks itself. You can also wash ANYTHING you want so no worries if God ever blesses us with another kiddo. The dryer also impressed me by drying everything and the steam function is amazing! Another plus is that our clothes are no longer beyond wrinkled. Yes, I do have to wipe down the rubber seal but not an issue really. The door stays open but you can not tell. It has a magnet that props it open which is a plus. This set has a drainage hose so if for some reason your washing machine locks up all you have to do is drain it and the door will unlock. Major plus because we had read where people had their clothes stuck in their front loads for days till a repairman could come out. Now on older models it is suggested that you drain your front load washer once a month. This set does not require that but I am going to do it just to be safe. I drained it for the fun of it after just two loads and you would be amazed at how much water was in the bowl! I can only imagine it sitting there all the time. Ewww. Another major plus is that I now can fold laundry standing up. I use to sit on the floor and fold everything. So in the end I got over my claustrophobia and we are keeping the front loads. I will update my thoughts on them in a few months so y'all can see if I am still smitten with them. Since we decided they were staying that led to me having to paint the laundry room. I no longer had anymore Svelte Sage paint seeing as I had painted it three years ago and I could NOT just let the unpainted portion of the wall show. That would have driven me insane. Stay tuned for the reveal! 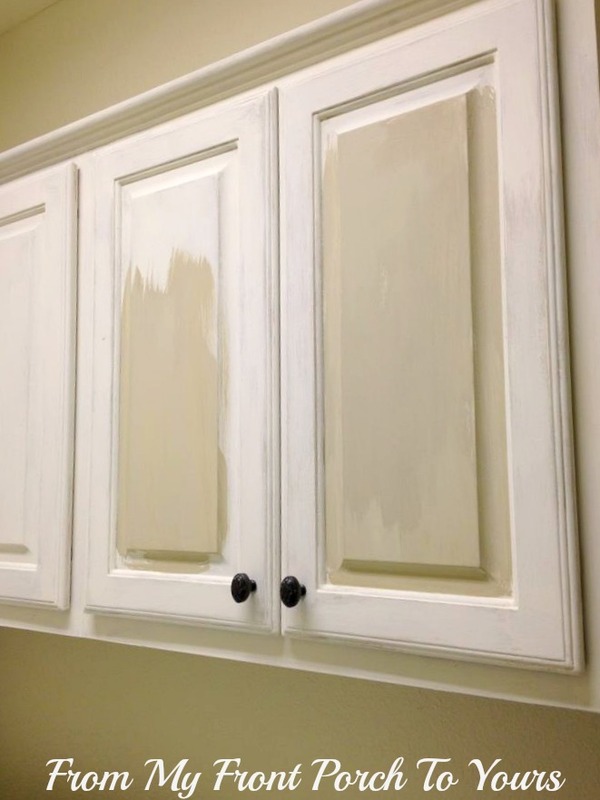 It does not even look like the same laundry room! Before I go I do feel I have to mention that this is just our experience. I know people who have the same top load and love theirs. It just was not for us. Oh and that new washer and dryer smell is present with the front load as well. Unlike the new car smell ya never want to go away, I hope it wears off soon. Glad to read your thoughts and I can't wait to see the rest of it. :) I have been wanting to do my laundry room for awhile. We have a front loader washer and I thought I would have rather had a top loader ! Thanks for trying both out so I know I need to just deal with mine :) I did not know you are supposed to drain them ! Going to do that this morning ! When I got my new set, it stunk bad. I had heard to get rid of new paint smell to cut open an onion and it would absorb the smell. I tried it with the smell of washer/dryer. Not sure if it actually helped or not.....but in my mind it did. ha!! Look forward to the reveal! We purchased the front load washer & dryer for the new house so they are still in the boxes. I believe they are going to be hooked up in a few days. Now I can't wait to try them out. Our top load now makes so much noise - they are downstairs, I am upstairs & you can hear them. But they are old so I am guessing that has something to do with it. I can't wait to see the laundry room... 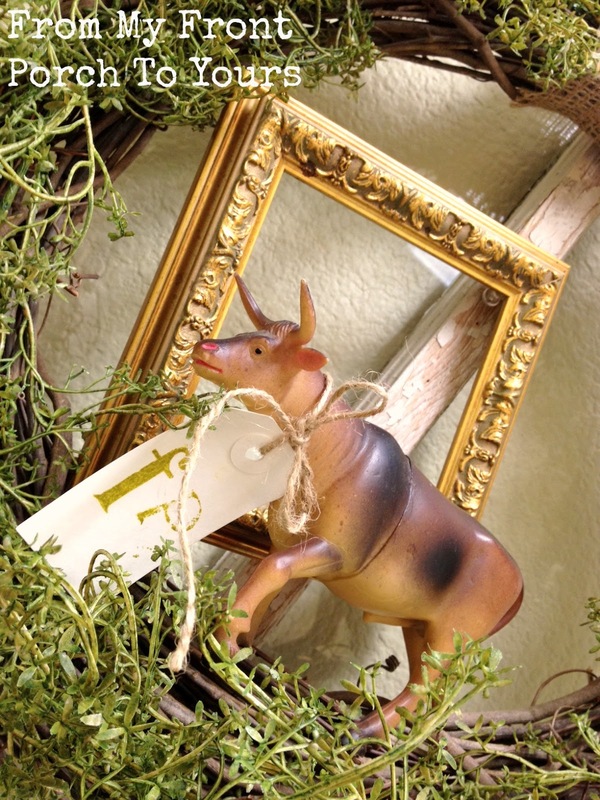 I love that vintage cow!! I didn't know that you needed to drain them either! How do we do that? Your new appliances are sure pretty.I had no idea there were load weights, etc. you had to worry about. No thanks. Sure glad I read your blog about these things, its good to be informed in case I come into some money and could buy the new snazzy ones. Our washer is an off brand I bought 4 1/2 years ago and works great. Our dryer is at least 12 yrs. old but seems to work pretty well. We have one of those long skinny brushes we use to clean out down in the filter area. The dryer is only used in winter as I hang out laundry in nice weather. We don't have a laundry room, it's more like a closet on one side of our mud room so nobody can see what it looks like unless closet doors are open. I'm really glad you addressed concerns about the new style washers and dryers. Not that I think I'm going to be getting either one any year soon. Think I'm glad to have the older style of both. They work great and no scientific concerns you addressed are a problem at this point. We do make sure we clean the filter on dryer after every load. If I have to turn dryer back on cause I wasn't around when load finished I make sure I clean the filter before I restart dryer. It's amazing how much lint is in a load a filter grabs. I'm a little paranoid about cleaning the lint filter as our neighbor in KY burned his house down 2 times in 3 yrs. He lived next to us and his electricity connection was hooked with ours. After the 2nd. fire I had that changed immediately. I came home one Friday night to flames and the house next door burned down to the ground. Scared me alot. Because of that electricity connection my electricity was off for hours also. Luckily that problem was resolved while they were fixing things up. We're a little paranoid about electrical things, no toasters, heaters, appliances left plugged in. I'd rather err on the safe side. Hope you got it all figured out and doing laundry won't be such a problem for you now. Came over to check you out from Anita at Cedar Hill. Understand congrats are in order for you too. Need to get RH & check you out there too! Funny you are posting about washer/dryers. My 13 year old Kenmore went out right before Christmas. I was already upset because my laundry room is a walk through from my back door to the breakfast room. It isn't wide enough for the new machines. We bought a cheap Kenmore dryer to use until the washer dies too. THEN we will have to decide what to do. Not looking forward to that because I know it won't make me happy. Room is just too narrow. Happy to see your input though. Who would have thought that buying a W/D would be such a torturous experience! So glad the top-loaders are working out for you. Glad you are happy with your machines.Can't wait to see the changes you make in your room! I love my 15 year old Whirlpool set and I pray I never have to replace it. Yours are beautiful. 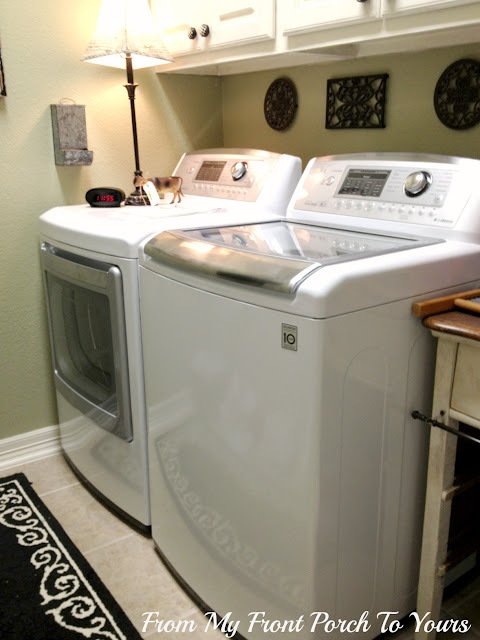 I am in the debate of what washer/dryer to buy.. How are the front loaders? Its been a few months now, just wondering your opinion? love love love the decor in your room! What a nice little read. Today I purchased a front loader. Tis my first. BUT I have friends that have a house of 25,000 foot and the only thing about it I have coveted is their front load washer. I would stand mesmerized enchanted at the gentle spin. I have not the trepidations you had about a front loader so I am excited. Thank you so very much for give me a glimpse of experiences. I hope It works out as well for me as it did you.